Central Oregon is a highly sought-after vacation spot in the U.S. for those who love the outdoors. And when you are planning your trip – full of skiing in the winter or kayaking in the summer – you will want to look at one of the best resorts in Bend, Oregon. Here, you will find quite a variety of accommodations that are sure to meet your need for adventure. Choose a mountain peak or river front view; find a central location to walk to the best local eats and brews, shopping, and spas. Take full advantage of your resort’s amenities as well, making it your home away from home and a mini vacation in itself. Luxurious furnishings, year round pools and hot tubs, and even crazy water slides are just a few of the things you will find at some of these great resorts. While hotels are nice if you are simply looking for a place to sleep, resorts have much more to offer. You will usually find resorts located next to more scenic surroundings on a larger area of land. Within the resort, you will find a variety of activities and facilities. There may be a spa, gym, pool, water slide, restaurant/bar, and so on. They are also typically situated in close proximity to outdoor activities. With a short walk or free shuttle/lift, you can access hiking trails, ski slopes, mountain climbing spots, and the like. Basically, resorts are better for a longer stay where you want to get in a lot of relaxing and activity. Here, you will find a list of great resorts that will help you make the most of your stay in and near Bend. This resort is about as close as you can get to the Deschutes National Forest while still lodging within Bend city limits. Tetherow Lodges is the perfect vacation spot for families, large groups, or corporate retreats, giving you access to various trails and Bend cultural activities. The resort hotel boasts 50 rooms, good for couples, singles, and businessmen. There are also various rental homes – up to 5 bedrooms – for large families and groups. Some of the accommodations also allow pets, even presenting a small welcome gift for your furry friend. 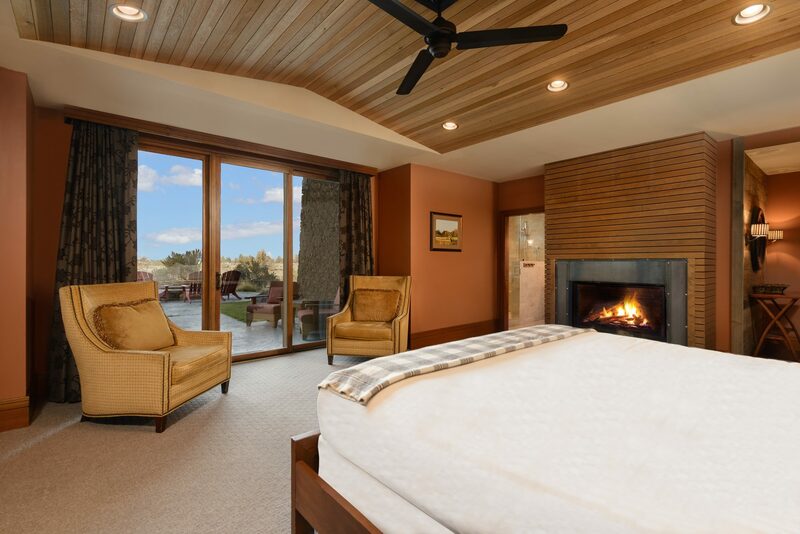 See why Tetherow is one of our favorite resorts in Bend, Oregon! If outdoor play is what you are looking for, there is no need to worry about your gear as most of the rooms have a “mudroom” area for storage. On-site at the Tetherow resort, you can find one of the best, award-winning 18-hole golf courses. A retail shop is also on-site where you can purchase not only any golf supplies you may need but also local goods like hand-crafted soaps and lotions. Tetherow Sport – the resort’s complimentary fitness center – offers a place for you to get in a quick cardio session or full weight lifting workout. They also offer personal training, group classes, sport massage, hot tub, and pool for lap or recreational swimming. While there is a shuttle that will take you straight to downtown Bend or the Old Mill district, where you can enjoy some locals brews and eats as well as shopping and concerts, there are also some great eating establishments located on-site. The Row offers family-friendly pub style food, serving three meals a day and nightcaps. For something a bit more sophisticated and romantic, try Solomon’s, offering an elevated dinner style with a large selection of wine. The Tetherow Café is great for those small bites and snack attacks, especially if you would like a drink or something to eat by the pool. At the end of the day, you can relax by the outdoor heated pool or by one of the fire pits to roast up some s’mores with the family. You can even rent an acoustic guitar for a nice campfire jam. Looking to make some memories in the Cascade Mountains? The Mount Bachelor Village Resort is ideal for those who may want easy access to downtown Bend activities or those who may want to have a relaxing retreat that doesn’t require you to even leave the resort. Whether you are getting married, organizing a family reunion, or joining your company for a retreat, there is something for everyone here. Mt Bachelor Village Resort is a greta place to stay exploring the great outdoors of Bend. There is quite a variety of lodging options at the resort. With condos, townhomes, and ski houses, you are sure to find something for your large or small group. Just note that there are no pets allowed on-site at the resort. You can find quite a few activities at the resort to keep you active and help you relax. Catch some sun by the pool or schedule a massage. You can even change up your look at the hair salon. The Athletic Club of Bend offers indoor fitness facilities including pools, indoor tracks, tennis courts, weight room, racquetball and squash courts, and group classes. Bike rentals are also available so you can make the short trip to downtown Bend. There is one restaurant at the Mount Bachelor Village Resort if you want to eat in rather than venture outside the resort. Bistro 28 is a made from scratch kitchen that is open for dinner during the week and on the weekends. When it comes to winter activities, there is no skiing at the resort; you are about a 30-minute drive from the slopes and there is no direct shuttle. However, you can ask about complimentary vouchers for the ski shuttle located 1.5 miles from the resort. Located along the banks of the Deschutes River, the Riverhouse is the perfect place to stay near downtown Bend. Conveniently located near the city limits, this resort is great for special events and business meetings. Their re-imagined hotel offers various room types, including some options that are pet-friendly. Every room is equipped with free wi-fi, 32” screen television, microwave, fridge, and Keurig coffee maker, and some even have in-room fireplaces. The number of beds and their sizes vary based on what you may need. Looking for a resort on the river? The Riverhouse on the Deschutes is a good choice. On-site at the Riverhouse resort, there is a fitness center, spa, lounge, indoor and outdoor pools, golf course, and conference center. Right off-campus, you have access to the Deschutes River for white water rafting and kayaking in the summer. The Mt. Bachelor Resort is right around the corner as well for skiing during the winter. In-room dining service is available if you need a night in to finish up some work before the big meeting. Or you can check out the resort’s restaurant, CURRENTS. They serve three meals a day made with local ingredients including goods from Sparrow Bakery and Stumptown Coffee. There is also a bar/lounge with beer, wine, and signature cocktails where you can enjoy music from local artists every Thursday evening. Just outside of Bend, Seventh Mountain Resort is the ultimate destination for all summer and winter activities. It is “where Bend meets Bachelor,” where you will find all of the recreational outdoor activities your heart desires every day of the year. We love this resort because it’s close to the trails. Book your stay at the Seventh Mountain Resort now! For something a bit smaller for a single individual, you can book the studio suite which is comparable to a hotel room. Each of the rooms is privately owned and decorated. You are only 7 miles from downtown for shopping and local dining. The Seventh Mountain Resort is located right along the Deschutes River for water activities in the summer and very close to Mt. Bachelor for skiing and other winter activities. There is even a complimentary shuttle available seasonally on weekends and holidays. If you wish to remain on-site, there are two pools, tennis and basketball courts, horseshoe pit, mini golf course, sand volleyball, and three hot tubs. You can even enjoy some horseback riding or book a fly fishing workshop. There is also the Outfitter Bar, which is open seasonally. They offer small plates and appetizers as well as locally crafted beers and cocktails. Stop by Adventure Market to stock your fridge with grocery essentials, local beer, and wine as well. 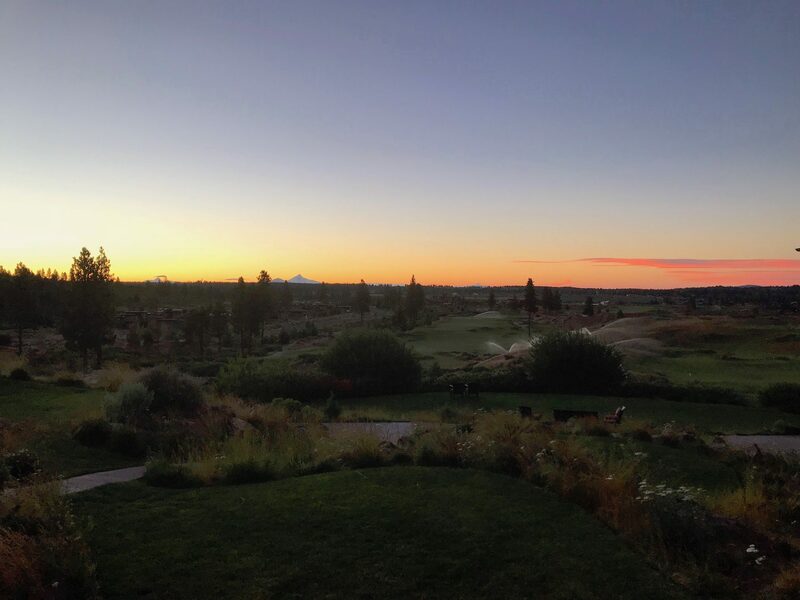 Named the best resort in the Pacific Northwest by Conde Nast Traveler, Brasada Ranch sits on 1,800 acres on the Powell Buttes just outside of Bend. Born from an authentic love of the land, you can be sure to find some of the best views available in Central Oregon. 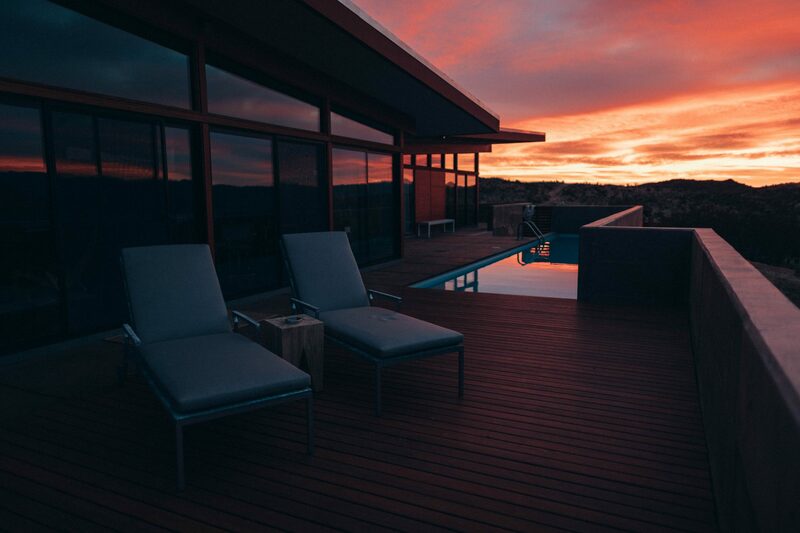 Ranch House suites are perfect for a romantic getaway, with panoramic views of the Cascades, a private firepit, and hot tub for soaking it all in. High Desert cabins are pet-friendly and great for family vacations, with one to four bedrooms available. For something more low-key, book a stay in a King guestroom, perfect for couples or solo travelers. Find out why Brasada Ranch got rated the best resort in the Pacific Northwest! From the resort, you have easy access to the Brasada trails, with 900 acres available for a leisurely horseback ride. At the resort, you can enjoy a workout at the athletic center, a massage at the spa, a swim in one of their pools, or a variety of sports like basketball, pickleball, fishing, and biking. There is even a hangout for the kids called The Hideout. There are three restaurants on-site at the Brasada Ranch where you can enjoy a delicious meal. Ranch House offers an intimate dining experience with a panoramic view of the Cascades; be sure to check out their weekend brunch and happy hours. Range Restaurant and Bar is open seasonally, offering an ever-changing menu featuring products from local farmers, ranchers, foragers, and purveyors. Sundance is also open seasonally for small bites and poolside fare. Pop into the General Store to find everything you need to stock your cabin. You can also find homemade and artisan gifts or grab a coffee or latte to go. Situated within Central Oregon’s 1,000-year-old juniper forest, the Pronghorn Resort is a premier resort located in close proximity to the area’s many outdoor activities, cultural interests, and culinary experiences. There are a variety of suites and lodging options at the resort, with suite choices from one to four bedrooms as well as a junior suite. 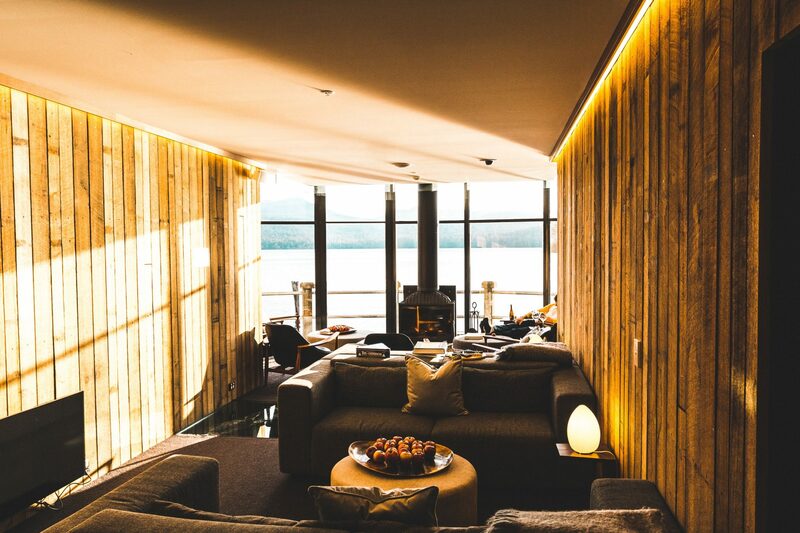 Each has a luxurious, cabin-like feel to it and is individually decorated and furnished. Find out why it’s worth staying at the Pronghorn Resort, surrounded by 1,000 year old trees. They also recently opened the Huntington Lodge, a great central location to all of the food and activities available at the resort with a gorgeous view of Mt. Bachelor and the Three Sisters. You will never want for things to do during your stay. Enjoy a game of golf at one of the two award-winning courses – the Tom Fazio Championship course and the Jack Nicklaus Signature course. Need a bit of help and organization in your game? The Pronghorn Academy offers instruction with packages offering breakfast and lunch with your 18-hole game. In addition to golf, you will also find pools with waterslide, fitness center with classes, tennis, pickleball, basketball, biking, and walking trails. A stay at the Pronghorn Resort also has you located close to all nearby Bend activities located at Old Mill and downtown. Enjoy a meal or drink at one of the restaurants on-site. Cascada is located in the Clubhouse. Open seasonally in spring and summer, you will find a casual, family-friendly bistro offering light far. You can also check out the Trailhead Grill for fresh and healthy poolside dining. Be sure to check out the live music on the patio on Wednesdays during your stay. Looking for a spot to enjoy some camping right next to all of the summer and winter activities available in Bend? The Elk Lake Resort is the place for you, with everything you need to camp out in luxury. Enjoy the close access to the great outdoors at Elk Lake Resort. There are several lodging options available, but not like you will find at other resorts. Their cabins feature the traditional log exterior with two to three bedrooms inside, full kitchen, and bathroom. If you want to spend the night outdoors but don’t want to give up all the luxuries of home, try one of their glamping tents which includes two futons, dining/picnic table, lantern, and bedding (showers at the lodge). Or you can simply book a tent or RV site to bring your own lodging. Just 25 miles outside Bend city limits, you have access to all summer and winter activities, including skiing, hiking, kayaking, and rafting. Rental equipment is available if you don’t bring your own. There is also a bar and restaurant located within the historic lodge. They offer rustic American fare, local beers, and specialty winter cocktails. You can even enjoy a gourmet holiday meal, perfect for Thanksgiving, Christmas, or Valentine’s. Reservations are recommended. Bend isn’t the only place in Central Oregon that offers resorts with such unique experiences. Venture just outside the city to Redmond, Sisters, or Sunriver to find some other great resorts with beautiful views and a variety of outdoor activities to enjoy. Located in Sisters, Black Butte Ranch draws visitors to the sunny side of the Cascade Mountains, with a view of no less than seven mountain peaks. With 1,800 acres of private land, 120 vacation rentals, and award-winning restaurants, you are sure to enjoy your stay. Black Butte Ranch is a perfect retreat close to Sisters – Book your stay now! A wide range of lodging options makes this resort ideal for everyone, from the individual traveler to large families with pets. There are private lodge rooms, two to three-bedroom condos, cabins, and spacious custom homes for rent. You have plenty to keep you busy both on-site at the resort and nearby. With a golf course, horseback riding trails, swimming, tennis, equipment rentals for biking, skiing, and water sports, you will never run out of things to do. The Glaze Meadow Recreation Center is also available to guests. Here you can enjoy classes – like hydro fit – weight lifting, and cardio. Inside there is also a snack shop that is open seasonally and a sports shop for any equipment you may need. There are several choices for dining at the Black Butte Ranch resort with four establishments to choose from. The Lodge Restaurant offers upscale family-friendly dining for dinner. Aspen Lounge is a bit more casual, offering small plates and daily specials as well as happy hour; kids are welcome until 7:30 pm. Lakeside Bistro is great for breakfast or lunch by the pool, with coffee and pastries available all day. Robert’s Pub, located inside Big Meadow Clubhouse, is a great choice for summer pub fare. The FivePine Lodge & Spa is also located in Sisters and has been voted Central Oregon’s most romantic getaway. Centrally located 25 minutes from Bend, 10 minutes from Black Butte Ranch, and 45 minutes from Sunriver, there is plenty to do and explore – if you ever feel like leaving the resort. Lodging options include several cabin and suite types, ranging from romantic to family-friendly. The Classic, Romance, and Serenity cabins are all perfect for couples while the Caboose cabin is great for families. There is also the Upper Townhouse suite for families and Patio suite for couples or business travelers. See why FivePine Lodge was ranked no. 1 for Central Oregon’s most romatic getaway! FivePine offers amenities that make the resort feel somewhat like a bed and breakfast. You have daily tea and coffee service as well as nightly wine and beer reception. There are also outdoor lawn games available to play and bike rentals for exploring the trails and surrounding area. Here you will also find some unique experiences to enjoy. Stop in Shibui Spa for a world-class treatment and massage after a fireside cup of tea in the relaxation room. Sisters Movie House offers a variety of films – first run, independent, documentary, foreign, and animated – which can be enjoyed with bistro style food and alcoholic and non-alcoholic beverages. You can also pay a visit to the Sisters Athletic Club. They offer classes, weights, cardio machines, and pools for lap and open swim. On-site at the FivePine Lodge you will also find Three Creeks Brewing. Open seasonally for the summer, this rustic brewery and restaurant offers a variety of pub fare for you to enjoy. Just minutes from Bend, Sunriver Resort is located in – you guessed it – Sunriver. Here, you can expect 300 days of sunshine per year, giving you the perfect location for outdoor activities all year round. Sunriver Resort has several lodging accommodations between their resort hotel and vacation rentals. Amongst these, there are over 70 accommodations that also welcome pets. We love the setting of Sunriver Resort. Find your retreat now! You may love it here so much that you will want to move in. No problem; our ultimate guide to real estate in Bend can help you find just what you are looking for. There are plenty of on-site activities to engage in. With four championship golf courses, Sunriver Stables for horseback riding, nearby skiing at Mt. Bachelor, and a world class spa, you will never run out of things to do. Other amenities at Sunriver Resort include swimming pools, tennis and pickleball courts, and nature center and observatory. You also have easy access just outside the resort to skiing and biking as well as a marina. Being only minutes outside of Bend, you can also enjoy explore their downtown area and Old Mill district. There are few resorts you will find that have as many food options as Sunriver does. Your choices include Carson’s American Kitchen (a lively restaurant with American fare), The Grille at Crosswater (northwest family dining), Twisted River Tavern, Zeppa Bistro (salads, paninis, and brick oven pizzas), Merchant Trader Café (pastries and coffee), McDivot’s at Woodlands (breakfast sandwiches, burgers, deli sandwiches, and snacks), Starbucks, The Backyard (with 16 regional brews on tap), and The Spotted Frog (poolside fare with full bar). Just outside of Redmond is Central Oregon’s best family resort, Eagle Crest. Situated on 1,700 acres of high desert against the Cascade Mountains near Bend, you will find a variety of activities and lodging accommodations that are suitable for the whole family. The resort features a boutique lodge with 100 renovated guestrooms and vacation rentals with two to four bedrooms to accommodate families and groups of all sizes. Eagle Crest Resort is a perfect spot close to the stunning Smith Rock State Park. The rental homes include private patio and BBQ areas and are connected to the resort by walking trails. You can also find accommodations with private hot tubs that also welcome pets. The whole family will enjoy their stay with activities quitable for all ages. There are three 18-hole golf courses, horseback riding trails, three sport centers (with basketball, tennis, volleyball, racquetball, and a variety of classes), five pools, and a spa. There are also kids games, bike rentals, and a splash park at the lakeside. Situated along the Deschutes River, you have easy access to hiking trails and fly fishing as well as Smith Rock State Park (14 miles away). You are also near Bend and Redmond where you can find local eats and shopping. On-site at Eagle Crest Resort, there is quite a variety of eating establishments. Aerie Café is located in the lodge; kids 12 and under eat free here. Niblick & Greene’s and Silverleaf Café are located in the Clocktower building where you can find gourmet dinners, sporting events on TV at the bar, groceries, and coffee with pastries. Greenside Café is next to the golf shop on the Ridge Golf Course where they have daily specials, burgers, sandwiches, and salads. Finally, Gretchen’s Famous Dawgs is open seasonally by the pool where you can find small bites, sno-cones, and cold beverages.